The rear bench seatback for normal loads (example A). The front seatbacks with the rear seatbacks folded down, as is the case for maximum loads (example B). If you have to place objects on the folded seatback, it is necessary that you lower the headrests before folding the seatback so that it can be folded as flat as possible against the seat. Always position the heaviest items directly on the floor. 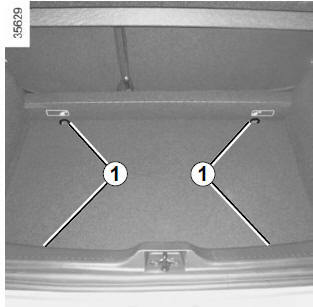 Use the lashing points 1 on the boot floor, if these are fitted to the vehicle. The luggage should be loaded in such a way that no items will be thrown forward and strike the occupants if the driver has to brake suddenly. Fasten the rear seat belts, even if the seats are not occupied.